If that question just left you feeling mildly (or highly) panicked, you’re definitely not the only one. While lots of people are perfectly comfortable bobbing around in the shallow end, the Centers for Disease Control reports that more than one third of adults in the U.S. cannot swim the length of a pool. As someone who could literally swim before I could walk, I can’t tell you how much this breaks my heart. Not only because it’s dangerous and scary, although that’s certainly a huge factor. (I mean, 10 people drown every single day in the U.S. alone.) But also, oh, you guys — if you have no idea what it feels like to glide through the water on a hot day, and if you’ve never experienced the pure joy of jumping into a pool with no purpose but to create the biggest splash possible, you’re missing out on one of life’s simplest pleasures. Also? Swimming is a hell of a workout, and it’s one that many adults are able to continue long into their senior years as higher-impact activities become troublesome. 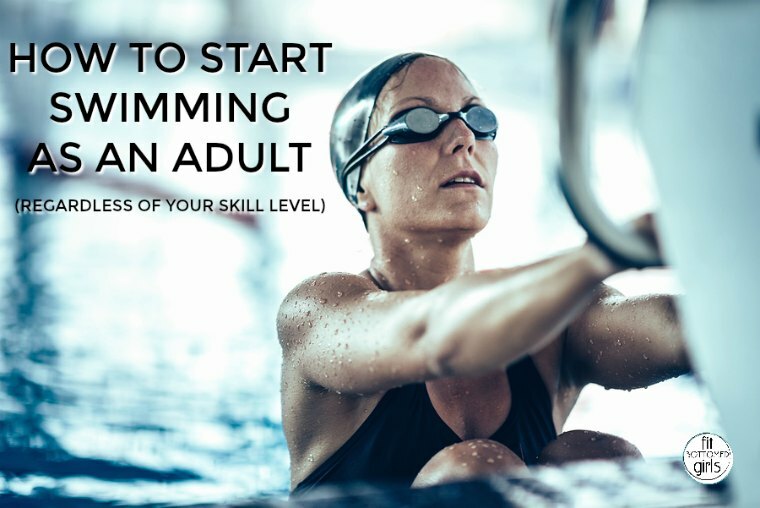 I actually feel strongly enough about this that I recently got certified as an Adult Learn-to-Swim Instructor with U.S. Masters Swimming (USMS), and, because April is Adult Learn-to-Swim Month, I wanted to share a few ways to get started swimming, regardless of your current ability level — and address a few common complaints I hear all too often. Suit up. You don’t need anything too fancy, but you will want a swimsuit that stays in place with some movement (which means that wicked cute strapless push-up bikini top is not an ideal choice), goggles, and, unless your hair is very closely cropped, a swim cap. Pro tip: If your hair is long-ish, braid it before tucking it up in the cap. It’ll make it easier to manage when you put the cap on, plus it’ll be far less tangled after the fact. Find a pool. If you have a swimming background and just haven’t been in the water in … forever, then maybe all you’re lacking is access. Lots of gyms and fitness centers have lap swimming, although if you’re considering a membership somewhere new specifically for the pool, I’d recommend asking specifically about their lap swim times, as some only have a few lanes and may dedicate them to other aquatic classes fairly regularly. Make sure ahead of time that you’ll be able to swim laps when it works for your schedule. Find a class or instructor. If you’re afraid of the water or truly don’t know how to swim, working with an instructor or joining a class specifically designed for brand new adult swimmers is absolutely the best choice. I know I’m biased, but I think USMS is a really solid resource. You can easily search for instructors with the Adult Learn-to-Swim Certification in your area. You could also reach out to your local YMCA and any public pools, as they’re likely to have information on current or upcoming programs that would be a good fit for you. Find a coach or a club. If you have no problem cranking out enough laps to constitute a workout but know you’ve got room to improve, well, let me tell you from experience that joining a local club just might rock your world. I honestly thought I was pretty good — I was able to hang with reasonably speedy swimmers in my first couple triathlons, at least for the first half of the swim. But after just a few classes where I swam with a masters club and got actual instruction, I realized how far off my form had been. (Turns out, you want your face FULLY in the water. Like, all the time!) Swimming became easier, faster, and far more fun. Plus, swimming with a group (and, swimming with a planned workout — more on that in a sec) is a million times more motivating than swimming alone. And I say that as someone who loves to swim! I’ve heard them all — and, honestly, probably used one or two myself back in the day. If I don’t hit up your specific concern, drop it in the comments and I’ll help you with a solution! Swimming is too hard. Well, yeah — if you don’t do it much, it probably is pretty taxing. It’s a full-body workout, it uses muscles you don’t use and in ways that are pretty unfamiliar. But when you do it more (and do it properly), it becomes easier — fast. Don’t worry about how many laps you can do in a row to start — that’s really not how swimming is measured outside of a race. Focus on learning and using good form and getting in the water consistently, and you’ll be racking up yards in no time. I promise. It’s boring. I acknowledge that it’s a repetitive movement (but hey, so is running, so is cycling …), and sure, that line at the bottom of the pool doesn’t offer a ton in terms of thrilling scenery. Unless, of course, you happen to share a lane with Aquaman, am I right? Have a plan — and some variety. I never show up at the pool with a goal of getting in and just swimming for 2,000 yards. Because, yeah, that’s dull. Instead, I have a warm up (usually 300 swim, 200 pull, 100 kick, 4×50 drill/swim), I have a main set that incorporates drills and speed work on various intervals. I do some 50 yard sprints, I do some easy 200s. Maybe I even add some different strokes in. Breaking up the workout makes it easier to focus on what I’m doing in the moment. (Plus, let’s be real — it’s the only way I’m ever gonna keep track of how far I’ve gone!) You don’t need to reinvent the wheel, either — if you don’t have a workout in mind, check out one of these. Play with toys. Kickboards, pull buoys, paddles, fins, snorkels — these have specific uses to help you with your form, and also help serve the same purpose as above with breaking up the workout. Plus, they force you to focus on certain muscle groups, allowing you to give other muscles a bit of a break. Also? Toys are fun. They are! Try some tech. There are loads of cool options out there if you feel like exploring the world of swimming technology. There are watches that track your laps and provide feedback on your stroke (and no, they won’t take the place of a coach on deck, but feedback can certainly help! ), devices that whisper your heart rate in your ear, and you can even swim to your favorite tunes. None of this is necessary, of course — but if you find it fun and it helps you spend a little more time in the water, go for it! Join a group. I realize I recommended this already, but I’m dropping it here because it’s so pertinent to the boredom issue. I swim harder, farther, and with far more joy when I hop in the pool with other swimmers for a workout. You don’t have time to get bored if you’re trying to keep up with the rest of your lane! Change your environment. If you always swim at the same 25-yard pool (which is the standard length you’ll find for lap pools), ask around to see if there are any long-course (50-meter) options near you. It’s a really different experience! And if you have access to open water, look for groups conducting group swims, or form your own group and get out there. I’m not old/not fast/not serious, so I’m not joining a masters team. Okay, “masters” just means that you’re over 18 — and, as far as I’m concerned, that doesn’t make you “old.” I’ve been lucky enough to swim with a few different teams, and each of them has included members of all different ages and speeds — and everybody’s there with their own goals, coming from all kinds of backgrounds. Lots of people swim masters and never go to a swim meet, although you just might realize you love competing. Basically, in my experience, joining a masters group has been the easiest (and most cost-effective) way to swim in an organized group. You might have other options near you — I just urge you to consider masters as you search for your tribe. I’m a triathlete, so I don’t need to learn all the strokes they make you do in masters. So many triathletes just view the swim as something they need to get through in order to do the sports they’re competitive in. And it’s true, you don’t need to know how to swim a perfect breaststroke in order to complete an Ironman. However, spending more time in the pool is great cross training, and do you even know how much easier the rest of the race feels when you haven’t used up a huge amount of energy on the first (and shortest) part of the race? Also, I’ve never had a coach force me to do a specific stroke (although they’ve all been willing to help me work on them). If you only want to work on freestyle, I bet you can find a coach, club or class that’ll work with that. I’m uncomfortable wearing a swimsuit in public. This is a tough one, because while I know in my heart that fit bottoms come in every single shape and size, I also know that so many of us have a whole lotta feeeeelings around wearing a bathing suit. All I can offer you is this: You deserve to be there. You have the right to show up at the pool, get in a lane, and do your workout. Nobody’s workout — no matter how fit or fast they might seem — is more important than yours. NOBODY’S. If it helps, ask a friend to join you as you get in, even if they aren’t going to swim. Moral support is the bomb, yo. Remember, the more you go, the more comfortable you’ll feel. And, my darling, nobody is judging you the way you’re judging you. Guaranteed. I grew up swimming outdoors overseas and loved it. Swimming in indoor pools here in WI always leaves me with an ear infection. Tried ear plugs but couldn’t hear the instructor. They really didn’t help much anyway. Those drying ear drops with the isopropyl alcohol in them hurt like hell. Would love to start up again but got tired of a chronically painful draining ear. Any tips???? I reuse the ear dry container and make up my own solution, it is approximately 50/50 Iso Alcohol and White Vinegar (for PH balance). I make mine about 60/40 – a little heavier on the alcohol. No ear infections and cost effective as well.